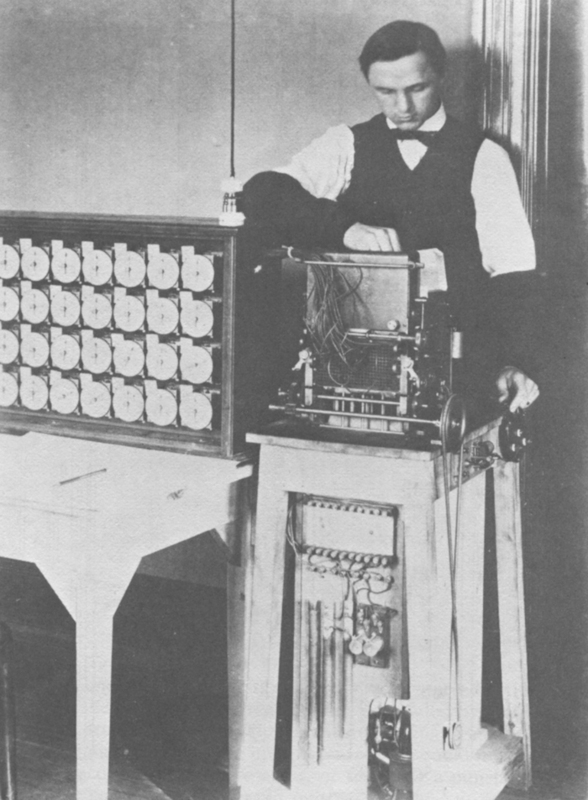 After the 1890 census, the US population continued to grow and the original tabulator-sorters were not fast enough to handle the 1900 census; so Hollerith devised another machine to stave off another data processing crisis" . "Toward the close of the 1900 Census, Hollerith speeded the processing of information by adding an automatic feed to his tabulator. It fed cards downward into the unit through a circuit-closing press. Leter, the pins of the sensing unit were replaced by brushes to further speed the flow of information and information punched in the cards began to control the operation of the units. Hollerith had begun to put information on the assembly line" . Photo: From Geoffrey Austrian, Herman Hollerith , originally from Scientific American , 1902. CLICK to enlarge.